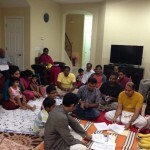 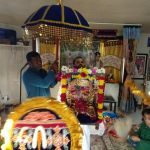 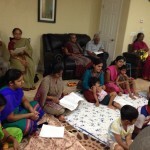 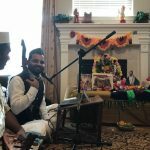 By the immense grace of Sri Swamiji,a special satsang was conducted by Orlando GOD Chapter, at the residence of Prajakata ji and Anand ji on Friday, July 10 2015 commemorating the special occasion of Purushottama Masa (Adika Masa). 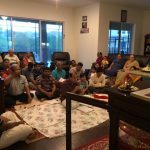 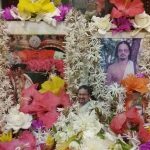 About 30 devotees attended the blissful satsang, where devotees chanted the divine names, sang Guruji’s kirtans and read Srimad Bhagavatam. 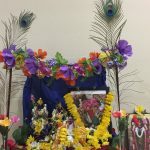 The devotees filled the air with divine names reverberating the entire time. 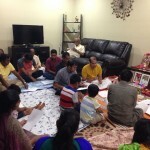 The devotees were blessed to experience the holy vibrations from the incessant chanting of the Mahamantra. 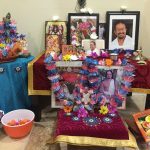 The satsang concluded with prayers to Sri Swamiji for unflinching bhakti and more and more divine service.